I’m not one of those people who used to be a vegetarian, but that’s not to say I haven’t thought about it sometimes. It was after reading an essay in one of those Best American collections about an American living in the UK that I thought for the first time about the ethics of eating animals. 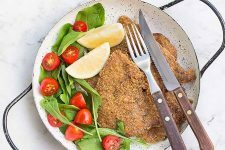 So far for me though, the enjoyment of a steady diet of poultry with red meat thrown in once or twice a week still trumps the alternatives, both because it’s such an easy way to get protein and because, honestly, it tastes good and is convenient. 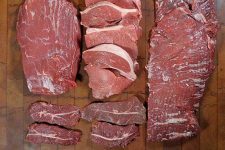 When I cook, rather than cutting meat out of my diet, I am looking for better sources of it that are more sustainably and humanely raised, such as a local CSA that could give me the option to buy meat directly from farmers in Illinois. I’d by lying if I said I didn’t buy ground beef or stew meat at the grocery store when it’s on sale, but I am trying to move gradually towards better choices,while still enjoying myself. 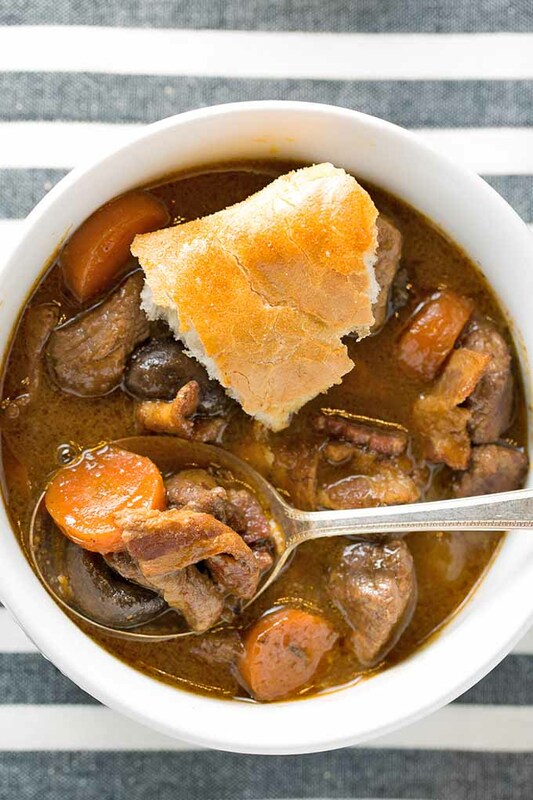 This stew is astonishingly simple to make with the slow cooker method. 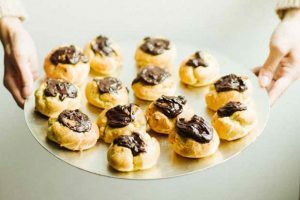 Decadent and savory, it’s no wonder it is a French classic – a true pleasure to eat and share with family and friends. When I pulled out a Tupperware container filled with it for lunch, reheating it in the microwave and bringing a forkful to my mouth, I literally exclaimed out loud to the office, “Mmm, this is good!” one hand hitting the desk and the other frozen in mid-air. 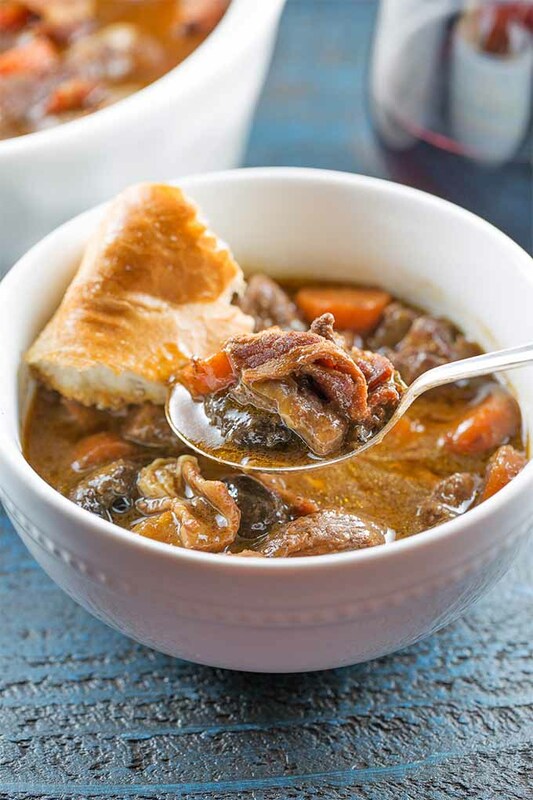 At once juicy and flavorful, rich and hearty, this stew proves as satisfying in the rainy days of early June as it is throughout the winter storms of December. 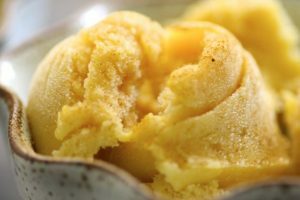 You definitely need to try this recipe. Soon. Very soon. 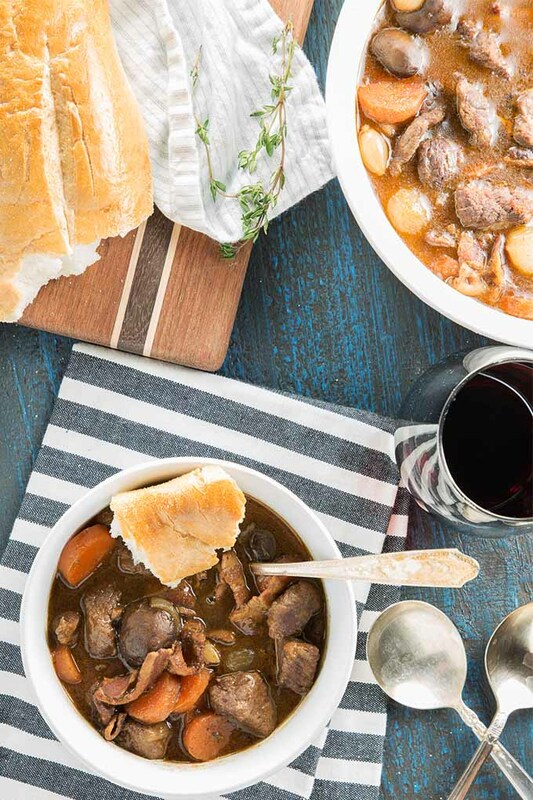 Hearty and savory, our take on this French classic is simple enough to make on a weeknight. 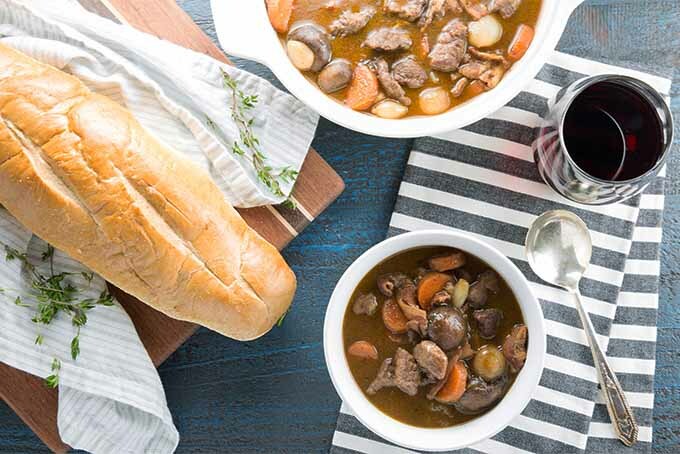 Try our slow cooker beef bourguignon recipe now. Set slow cooker to sear and preheat (or place a pot on medium heat). Cook the bacon until crisp, then set aside, reserving the grease in the pot. 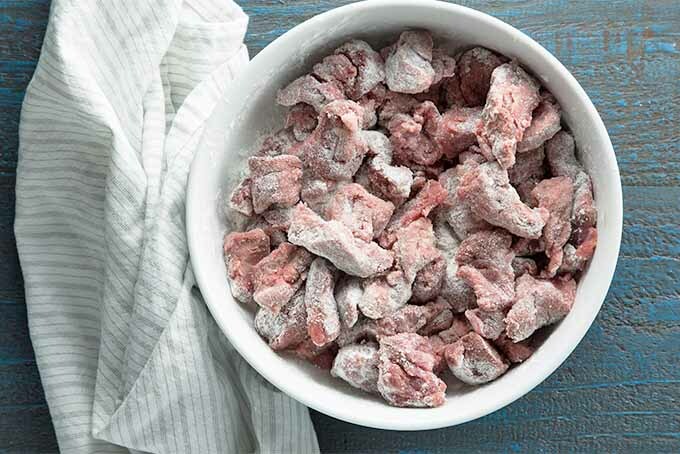 Dredge beef in flour seasoned with salt and pepper. Sear beef with the reserved bacon grease, browning on all sides. Remove beef and set aside. Saute veggies in pot with remaining bacon grease for about 5 minutes, stirring occasionally. Add tomato paste and saute for a few more minutes, stirring occasionally. Add wine and beef stock to deglaze the pot. 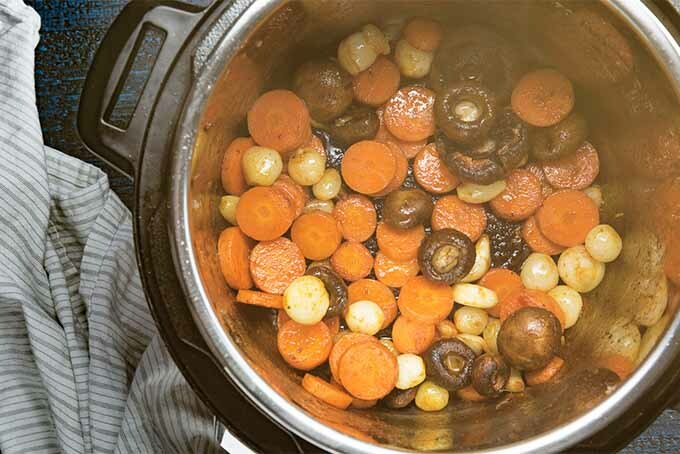 Transfer contents of pot to slow cooker if using a pan on the stove. Add herbs and return bacon and beef to the slow cooker. Cook on low for 8 hours. 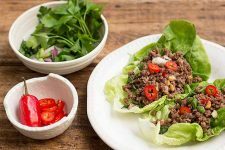 Remove the bay leaves and thyme sprigs before serving. Gather all ingredients on your counter. Chop the thick cut bacon into 2-inch chunks with a sharp chef’s knife or cooking shears. Unwrap the stew meat and pat it dry. Measure out the flour, salt, and pepper into a large bowl. 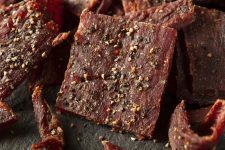 I prefer to use my pepper grinder for this, since you will get the best flavor from freshly ground spices – simply grind it into a small bowl and then measure out what you need. Set aside. 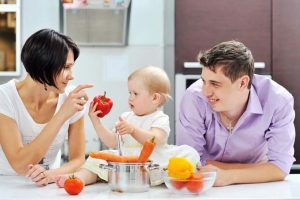 Wash the carrots thoroughly, peel them with your favorite vegetable peeler if desired, and cut into 1/2-inch medallions. Wash the herbs and set aside in a small dish. Clean the mushrooms with a dry cloth, being sure to remove all dirt and debris. Remove stems and set aside. With a sharp paring knife, trim the ends and peel the pearl onions. Peel and smash the garlic with the flat side of a large chef’s knife or cleaver. Measure out the tomato paste. Measure 2 liquid cups of pinot noir and set aside. If you aren’t a fan of pinot noir, feel free to use any Burgundy or full-bodied red wine. 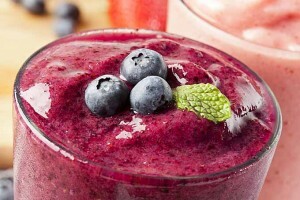 A good rule of thumb is to only cook with what you like to drink – no skimping on the quality when you’re cooking. You can learn more about cooking with wine here. 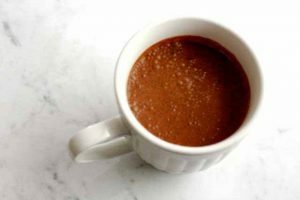 This recipe can be made in an Instant Pot, Breville Fast/Slow Cooker, or any type of slow cooker that has a searing function. 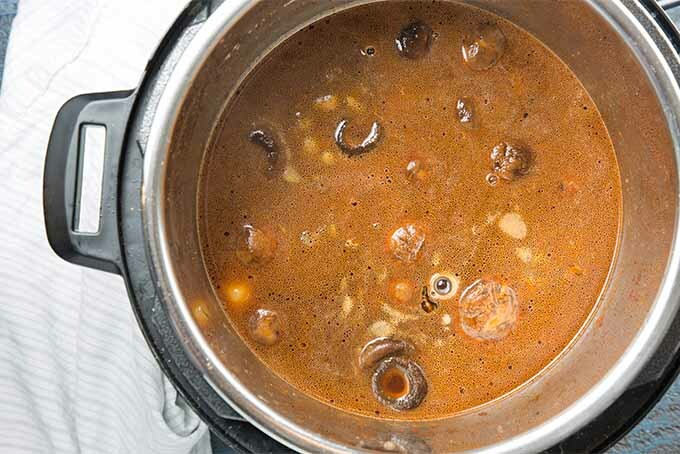 You can also use your Crock-Pot or standard slow cooker in combination with a pot on the stove for searing. 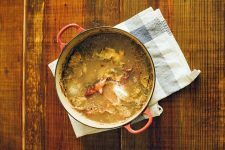 In your pot or with your slow cooker set to sear and preheated, add the cut up bacon chunks and cook until crisp, stirring occasionally to avoid sticking. Be sure to use thick cut bacon here or otherwise the pieces won’t hold up during cooking. 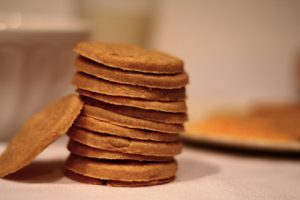 They will crumble and the big chunks you start with won’t be present at the end of the cooking process. 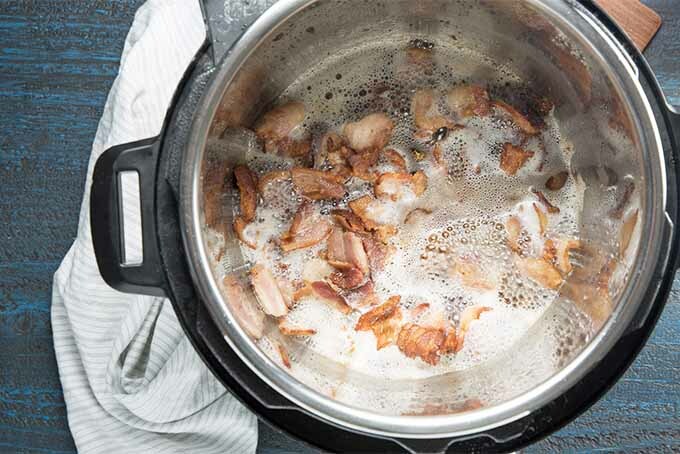 Once the bacon has cooked, remove it from the pot and set it aside for later use. Remember that bowl that you set aside with the flour and seasonings? Give it a good stir, and add the beef. Toss until each piece is thoroughly coated with the mixture. Note: I used stew beef that was already cut up. Feel free to use a whole roast and cut it up yourself if you prefer a certain cut, or already have something on hand. Add the beef to the pot with the bacon grease and sear it on all sides. This will only take a few minutes; we aren’t cooking the beef, just browning it. Browning the meat will provide more depth of flavor in the final dish. 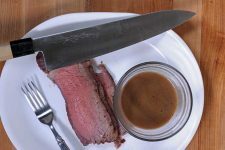 Once the beef has browned, remove it from the pot and set it aside. There should still be a good amount of bacon grease left in the pot. To this grease, add the onions, garlic, carrots, and mushrooms. Saute for about 5 minutes or so, stirring occasionally. Add the tomato paste and saute for another 5 minutes or so. Be sure to give the paste time to “bloom.” This will be indicated by a color change. The paste will be a darker, more robust looking red rather than the bright red color it starts off with. This process caramelizes the sugars in the paste and lends amazing flavor to the dish. At this point, all of the meat and veggies have been browned. Now it’s time to add the wine and beef stock. 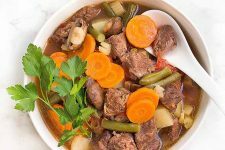 Homemade beef stock or beef bone broth is a delicious addition, but low-sodium store bought broth can also be used. We will use the liquids to deglaze the bottom of the pot. 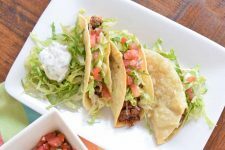 Tremendous flavor is stored in the fond, and we want to scrape the bottom of the pan as we add the liquid in a slow stream, to release all those flavors. 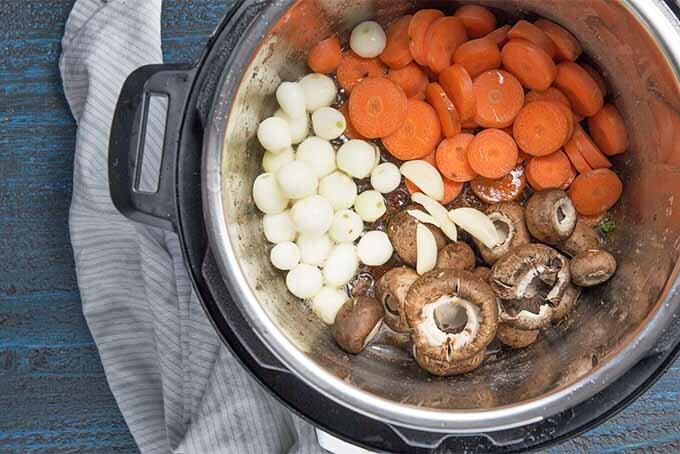 If you are using the slow cooker and pot method, transfer the veggies and liquids to your slow cooker. Add the bay leaves and thyme to the slow cooker now, along with the beef and bacon. Give the pot a good stir and cover your slow cooker with its lid. 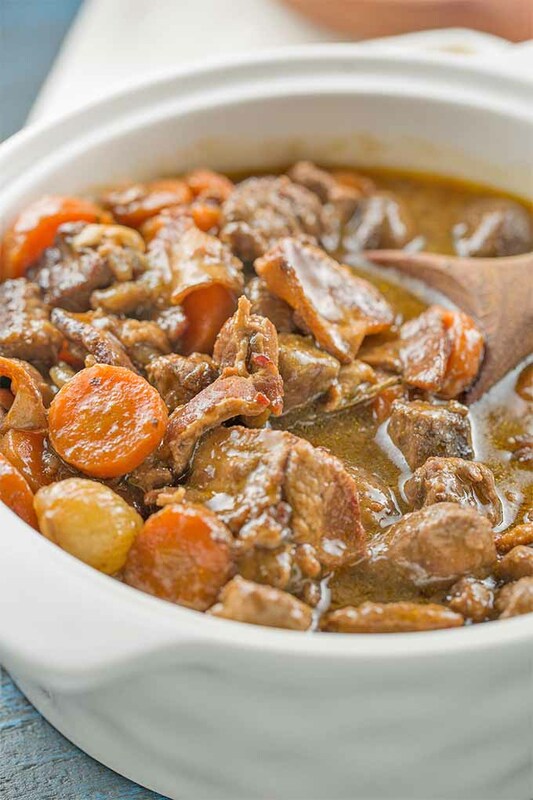 Set your slow cooker to low and cook for 8 hours, until the meat is tender and the flavors have melded to create a delicious stew. Don’t forget to remove the bay leaves and thyme sprigs before serving! 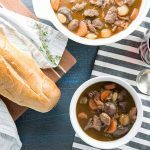 This classic French stew goes so well with a crusty loaf of French bread. I highly recommend dipping the bread in the hearty and flavorful sauce. Divine! 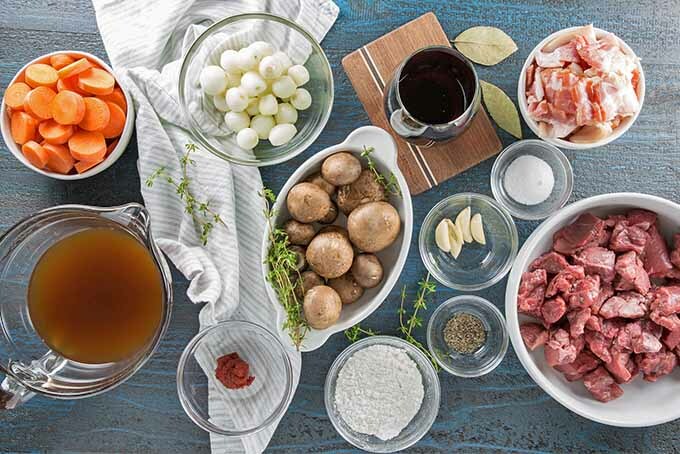 French cooking can be intimidating, especially if you’re attempting to make something like beef bourguignon for the first time. I’m here to tell you this: don’t be intimidated. 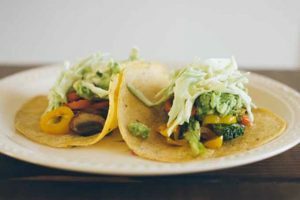 This cooking method takes the tedious prep and hard work out of the equation. 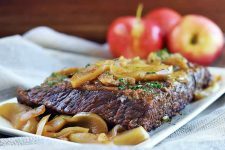 You can enjoy a decadent and hearty French staple at home in no time, and impress your family and friends. They’ll be sure you slaved away for hours! Let them think what they will; maybe they will offer to do the dishes. 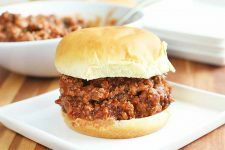 Try this slow cooker method now and be sure to comment below, letting us know how it worked for you! 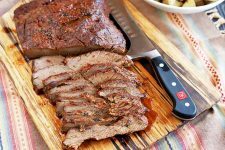 If you love slow cooker recipes, be sure to check out our slow cooker pot roast, baked beans, and butternut squash soup, too. 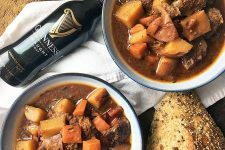 And beef up with more meaty dishes, like barbacoa, oven-roasted brisket and Guinness stout beef stew. Photos by Leslie Morrison, © Ask the Experts, LLC. ALL RIGHTS RESERVED. See our TOS for more details. With additional writing by Leslie Morrison. Originally published by Shanna Mallon on June 12, 2009. Last updated: April 4, 2019 at 21:20 pm. you bring such good points in this post today! when i lived in africa, on the way to school, we would pass by a cattle butchery. it stunk to high heaven and i once witnessed cattle being killed.in.the.street, and the road ran red with blood. i didn’t eat meat during the two years we lived there. anyway, like you i am slowly, but surely moving towards buying meats from whole foods or kosher shops. they’re expensive and inconvenient sometimes but it does assauge my conscience. it cannot be said that i’m an animal lover, but i am def. not an animal hater. i’m interested to hear your thoughts on the book. 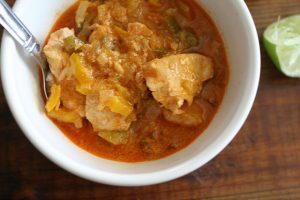 your stew looks hearty and it’s always so wonderful to be able to put raw stuff in the crockpot and the next time you open the lid, it’s all done for you! 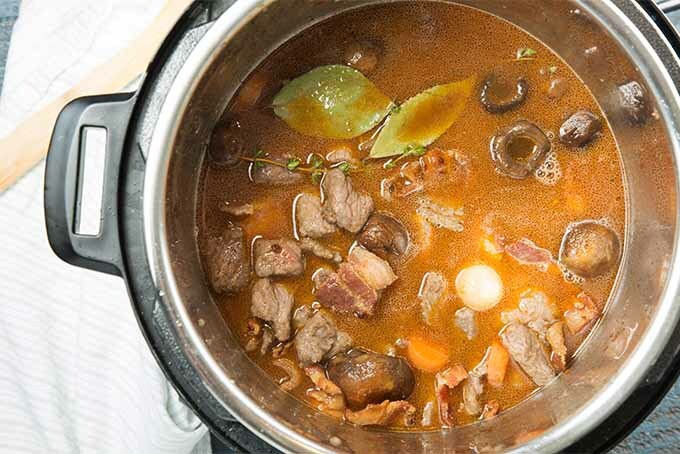 This looks wonderful – I love one pot meals. They seem so easy an you don’t have to worry about timing everything to be finished at once! Janet, That was such a sweet and thoughtful comment. I def think this is something worth returning to from time to time, reevaluating priorities and current choices. It’s a process, that’s for sure. I love the way you’ve found to make meat ethical and good and a part of your life. I made this the other night…so good. I’d highly recommend this for a rich meaty dish to any carnivore!